Since the 1970s, thousands of archaeological projects have been conducted across the United States due to historic preservation legislation. The Virginia Department of Transportation (VDOT) accordingly accounts for historic properties in the course of its activities, and the study of the Parnassus Site (44AU634) for the Route 42 improvements project is a good example of VDOT's commitment to them. Studies like this one typically begin with a survey, or search, for archaeological sites where road projects are planned, and may be followed by a testing or evaluation phase at potentially significant sites. 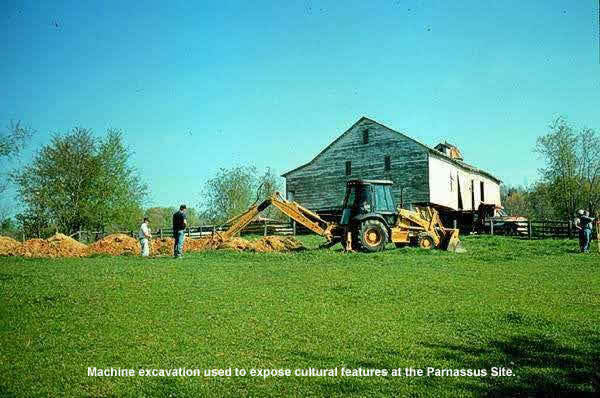 The final phase, if necessary, is a large-scale excavation, exemplified here at the Parnassus Site (44AU634), where the William & Mary Center for Archaeological Research performed such a study in 1999. This type of final, intensive study is designed to recover the important information that is present on a site. View the final report (pdf).